Agni-nakshatram. The star of fire. Chennai in June. The relentless, sweltering heat abetted by the elusive rains was adding to the misery of the denizens. Fronds of the coconut trees were crackling with dryness and dust. Luscious ripe mangoes hanging low from trees were enticing the fruit bats and Drosophilae. Oblivious to all this, Meera lay on her bed, in another world ,her waist-length hair strewn over her face, with a book lying open next to her. “Meee-raaa! Are you ready yet? ” her reverie was interrupted by the high-pitch voice of Sowmya Athe (father’s sister). Sighing, she sat up with a look of resignation, knowing what was coming her way. Her other two aunts, Sudha and Saroja Athe soon followed their sister into the room. ” Dreaming as usual, Meera! We knew it. That’s why we’re here early” said Saroja Athe triumphantly as they wafted into her bedroom, carrying piles of kanjeevaram sarees from their own wardrobe. Meera had come on a vacation with her father to her aunt Saroja’s house in Chennai and the 3 sisters whose tentacles spread all over the world, had taken it on themselves to find her a suitable groom. She had already met a string of non-descript men back home in Bombay and was looking forward to a restful break. Today, a prospective bridegroom was coming home to see her. ” I wish I were fifty years old and not have to go through this annoying rigamarole of meeting strange boring men! ” thought Meera to herself. Note:The most common uses of the subjunctive mood in English are conditions, suppositions, wishes, demands, suggestions, and statements of necessity. At least once in our lives, we’ve all muttered, “I just wish I were…” or “If I were more like…”, knowingly or unknowingly invoking the subjunctive mood.This week, the Daily Post has asked us to finish the following sentence for the writing challenge: “I wish I were.” This is a piece of short fiction inspired by the ‘arranged marriage’ system . The Daily Post has thrown a challenge to do something completely different this time. The writing challenges have actually already helped me to move out of my comfort zone several times. I wrote short fiction once, when I usually write non-fiction. I wrote poetry in my last challenge when i hardly even read it and I attempted to write on politics in a previous challenge. So, this time, I ‘m writing an open letter. You whiled away your time on gadgets and websites that were so painstakingly created by people of my generation (Gen X) for ‘useful’ purposes. You did not bother to acquire knowledge the way we used to, hours poring over books, as you believed all information was at the tip of the fingertips. You considered books and newspapers as antique ephemera. You answered ‘Nothing’ when asked what you did in school today. The only words you read were 140 characters long or the incoherent ones in instant messages on itouch. But yesterday, my gloomy prognostications were proved wrong. Yesterday, I had the honor of being on the jury panel in my son’s school to assess the students’ presentation as an indicator of academic progress. I saw a bunch of lanky 6th graders trying to hide their nervousness under a cloak of insouciance. As they presented their work in front of the jury, I realized that not only had they read books,but in fact several of them, with powerful, thought-provoking content. Books such as George’s secret key to the Universe, A Hundred Dresses and Samir Ek and Samir Do that dealt with issues of differences and discrimination . How certain children are ridiculed because they are different from the rest or conversely even though two children are very different, they can still be friends. By integrating these readings along with other activities, each student then presented their big idea or take- home message, each one a unique, distinct, and powerful idea. Such as ‘The law of nature is order and regularity’, “Difference doesn’t matter in friendship”, ‘Unity in Diversity’, “It is important to have harmony within us”. In this era of globalization, when the world has apparently shrunk, yet differences seem much wider and are rarely tolerated, I think it’s wonderful that these students are already thinking about these issues and reflecting on them. Hopefully, they will incorporate these ideas into their own lives when they are ready to step into the world and make their own decisions. I believe that education, apart from teaching you how to read, write and do math, should help you to think, reflect , believe in yourselves, be tolerant of other cultures and make right decisions . We can then look forward to a bright future where we can have more inspiring children like Malala ,who slowly bring about change one step at a time. 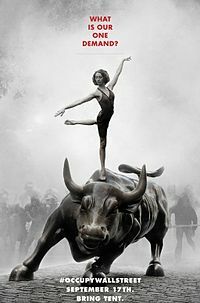 According to Wikipedia, the Occupy Movement started in New York on September 17, 2011 to address the issues of ‘Wealth Inequality, Political Corruption, and Corporate influence of government’. Some of the characteristics of the movement were ‘Occupation, Non-violent protest, Civil Disobedience, Picketing, Demonstrations, Internet Activism’. The Occupy movement spread to over 20 countries, but never made it to India. But I believe it was an Indian who first captured the attention of the world with the idea of a non-violent, civil-disobedience movement. 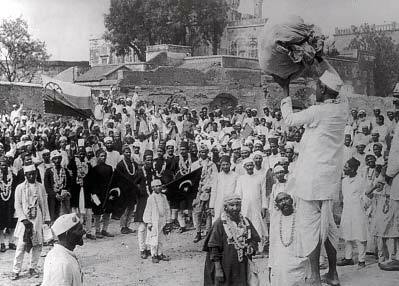 In the early 1900s as the Indian struggle for freedom from British rule gained momentum, several Indian leaders called for ‘home rule’, signing petitions and holding public meetings. But they weren’t taken seriously and the atrocities on the Indian multitude continued unabated. Then in September 1920, Mohandas Karamchand Gandhi called on all Indians to boycott all British manufactured goods and withdraw from all offices, factories and schools run by the British. Thousands rallied in support causing an unprecedented magnitude of disorder that challenged and shocked the foreign rulers. This was the ‘Non-Cooperation movement’, a nation-wide, non-violent protest, a watershed moment in the history of the Indian freedom struggle. Other non-violent movements- the Salt Satyagraha and the Quit India movement followed, both orchestrated by Mahatma Gandhi. It was again his commitment to non-violence that made him call off these protests when it was marred by a few violent demonstrations. But it set the stage for the formation of a free and independent India in 1947. Sixty-four years later, another Indian, a social activist and self-proclaimed Gandhian, Kishan Hazare, popularly known as Anna Hazare, initiated an anti-corruption movement. On 5thApril 2011(well before the Ocuppy movement), he went on a hunger-strike demanding a strong anti-corruption bill, the’ Jan Lokpal’ (People’s Ombudsman) to be passed in parliament. Soon, the nation was gripped in a patriotic fervour as thousands came out in support, holding rallies and sporting ‘I am Anna’ caps and T-shirts. The ‘India against corruption’ campaign caught the media’s attention, calling the movement ‘the second freedom struggle’ and fuelled the people’s certitude that he would redeem the nation from corruption. Eighteen months later, the ‘struggle’, riddled with controversies, is limping in bits and spurts. With more governments becoming corrupt and turning a blind eye to the common man’s woes, protests seem to have become a platform for the denizens to air their grievances. 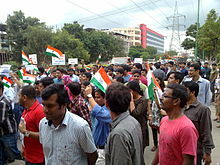 Although, over a period of time, most protests lose steam and credibility due to lack of consensus and/or strong leadership, unclear or unreasonable demands and controversial methods of protest. Solutions are not obvious. But we aren’t looking for Utopia, just a corruption-free , transparent government that ensures that the taxes we pay go towards progress of the nation and not into the pockets of a few chosen ones! Coming from a middle class family in India, especially one with several members, it is quite unlikely for one to possess a family heirloom. There aren’t any sentimental childhood possessions either as they were all donated before the move from Mumbai to Bangalore 20 years ago. Materialistic possessions are anyway so temporary- perishable; it’s the memories that are to be treasured for eternity! With the passing years, one tends to rely more on pictures to conjure up events of the past, but there are some that do not require a tangible entity, the memories remain entrenched in one’s minds forever! Like the time, one evening, coming back home after playing with friends (I was around 8 or 9), I found my father eagerly waiting for me at the door. He ushered me into the dining area, brimming with excitement and said, ‘I have a surprise for you’. I followed him with puzzlement and wonder to the side table at the corner of the room. On top of the radio that stood on the table, there was a bird sitting motionless, barely a foot away from me, staring with beady eyes! At first, I thought it was a stuffed bird and then it cocked its head to one side as if it was sizing me up. It was a mynah (a bird of the starling family) which had somehow found its way into that secure corner of our second floor apartment. I asked my father if I could keep it as a pet, but he flatly refused saying that birds are meant to be free, flying out in the sky, not confined in homes. The mynah remained there for a few more hours, confused and scared and finally flew out of the door that my father had left open for its sake. The memory is a testament of my father’s kindness and childlike enthusiasm for many things, trivial or otherwise, in life. There are a few of his worldly possessions that I have held on to, things that embody his effulgent qualities. 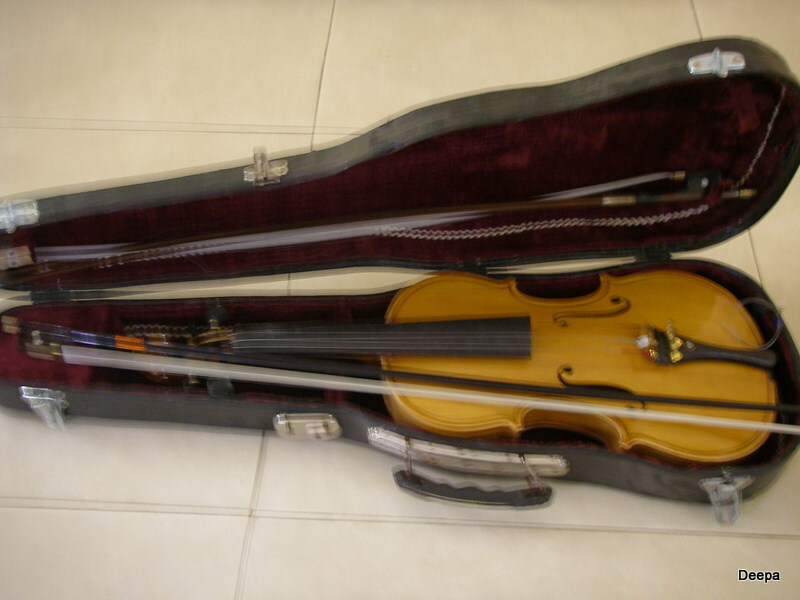 This violin is a symbol of his joie de vivre and zest for life. He bought it after retirement in his continued quest for new learning. He even carried it to the US, when he, along with my mom, came to help me with my firstborn, to practise in his spare time. But I didn’t ever get a chance to listen to him play as he fell sick the very next day and passed away a week later. It is now lying broken in its case (damaged on its way back to India), and I hope one day to have it restored and learn to play it myself. 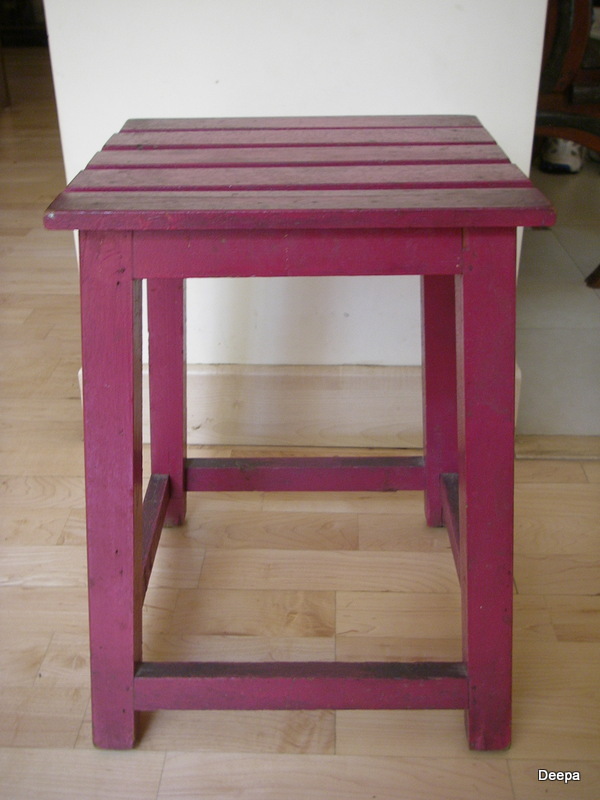 There’s nothing ornate or wondrous or antique about this stool. Rather, it embodies his spirituality and pious nature. He used it as a prayer seat; sat on it every single day after his morning ablutions, in a corner of the kitchen (which was also used as a prayer room) with his eyes closed in meditation. It continues to stay in a corner near the prayer room as we cannot dream of putting it to any other use. A few of my favourite things? I doubt if I have any. But some I cherish as a legacy of a life of goodness, vivacity and devotion. The Daily Post has thrown a challenge to use active and passive voice in an engaging way. A year ago, I was hospitalised for dengue and here’s an account of one day in the ICU. I was wheeled into the MICU, a huge spacious room with large glass windows and transferred onto the bed right next to the entrance, for which I was glad. Not that I wanted to escape or anything, but just in case! The nurse’s station was right in front of me and through the window across the room , I could see a Gulmohar (mayflower) tree , in full bloom, with flaming orange flowers, the only bright spot in the otherwise gloomy surrounding . It was quite unnerving to see the other patients (about 10 in all), with a host of tubes, bandages and ventilators! Just as I was settling in, an X- ray machine was wheeled in and I was informed that a lung X-ray had to be taken. The handler loudly announced “Radiation” and all the nurses ran over to the other end of the MICU! No other patient was awake. The only sounds were of the monitors beeping away. Time was moving like a snail with crutches! I had to undergo platelet transfusion due to the extremely low platelet counts and soon, the transfusion was set up. It was late evening by the time it was done and I got to meet my husband briefly. He came covered from head to toe, in hospital garb. I could only see his eyes, looking strained, but trying to smile and make light of the situation. The next morning, I was woken up at 5.30 am by the nurse to have my temperature checked and my blood drawn for testing. Then , a lady attender came to ask me if I would have a wipe-down bath in bed or if I would walk to the bath. I opted for the latter. I was escorted to the bathroom at the far end of the MICU and handed a toothbrush, toothpaste and a bar of ‘Dettol’ soap with instructions to wash my hair. I stared at the bar of soap balefully, wondering if my lovely hair would protest, but since it was uncertain when I would lay my eyes on shampoo next, I went ahead with it! A change in the nurse’s shift brought a boisterous bunch of nurses, unlike the soft-spoken ones from the previous day. One of the nurses sitting at the station was learning Sanskrit alphabets from another nurse, while a third was describing her facials and how she likes to lick the face pack applied at the end! Soon after, the head of the ICU, Dr. Shiv Kumar, a middle-aged, portly , gregarious man, walked in with his entourage of interns and PGs. After the rounds, they got together at the nurse’s station and started discussing the first International F1 race taking place in India later today. One of the interns had apparently bought a ticket to the F1 for Rs. 30,000/- and Dr. Shiv Kumar found it incredulous that someone could spend so much money to watch a sport. He questioned a young lady intern if she would spend that kind of money and when she answered in the affirmative, he seemed even more amazed. Then he asked 2 other interns, and he was only satisfied when they both replied that they were not crazy about F1 to spend a horde of money on it! An entertaining morning to say the least!